Saint John School Faith in Action teacher, Karen Klenk, had no idea when she assigned a final assessment on her unit on the Beatitudes that two of her students would display their knowledge in such a creative way. Beyond a traditional test on the material, Mrs. Klenk allowed students to create a project to demonstrate their understanding of the Beatitudes. 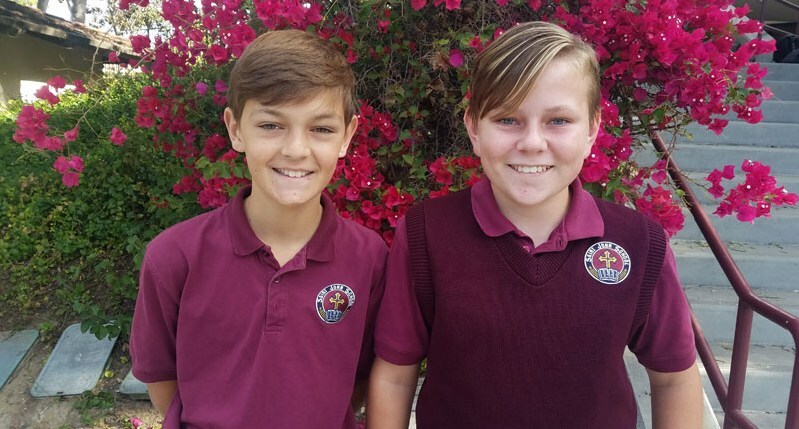 Two 7th grade students, Braden D. and Giano S. accepted the challenge of the project and decided to create a rap about the Beatitudes. The boys initially thought that this would be a fun way to study. What they didn’t anticipate was that creating the rap really helped them gain better insight and understanding of the Beatitudes. With some technical help from Giano’s dad, the boys spent approximately 10 hours writing lyrics and recording their rap. Once they submitted their project, it was clear to the Saint John staff that the boys created something special. In order to help spread the message of the Beatitudes, Braden and Giano decided to further fine-tune their song and and created an accompanying video (again with the help of Giano’s father). The video has been posted on You Tube along with the ability to purchase a CD of the rap. Keeping with the theme of service to others at Saint John School, the boys decided the proceeds from the sales of the CD should benefit Corazon, a non-profit group that Saint John School supports. As stated in their rap, Braden and Giano encourage us to live our faith and be peacemakers!